Afterimage Gallery owner/director Ben Breard opens a "major exhibit of historical imagery" that is of interest to collectors, news organizations, historians, and galleries and museums. April 11, 1969 LIFE cover shot by Bob Gomel. Dallas, TX, January 12, 2011/Photography News/ The triumphs and tragedies of the 1960s provided photographer Bob Gomel and his LIFE magazine colleagues extraordinary opportunities to advance American photojournalism. Beginning Friday, Jan. 21, 40 of Gomel’s LIFE images from the 1960s will be exhibited at Dallas’ Afterimage Gallery, one of the oldest art galleries devoted to photography. The “Multiple Exposures” exhibition includes images of presidents John F. Kennedy, Lyndon B. Johnson and Richard Nixon, the 1963 Freedom March in Washington, The Beatles and other entertainers, Malcolm X, and sports figures such as boxer Muhammad Ali, Texas baseball legend Nolan Ryan, and golfer Arnold Palmer. Several unpublished images – including one of 90 heads of state gathered around the catafalque at the Kennedy funeral and another of Kennedy emerging from America’s first space capsule at the Johnson Space Center in Houston – are in the exhibition. Two images in the exhibition were among the first multiple exposures published as photojournalism by LIFE. 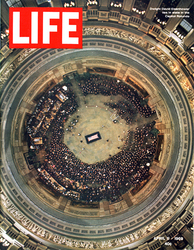 Another image, a 1969 cover shot of president Dwight Eisenhower lying in state, was the first event photograph taken from the top of the Capitol Rotunda. Born in New York in 1933, Gomel earned a journalism degree from New York University in 1955 and then served as a U.S. Navy aviator. Gomel joined LIFE in 1959 and shot for the immensely popular magazine for a decade. He later shot national advertising campaigns for Audi, Bulova, GTE, Merrill Lynch, and Shell Oil, among others. A gallery reception Friday – from 7:30 p.m. to 9:30 p.m. – will open the two-month exhibition. Afterimage Gallery is located at The Quadrangle No. 141, 2800 Routh Street, in Dallas.